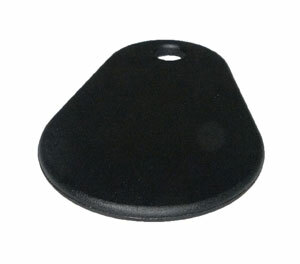 A black 45mm x 30mm x 2.2mm keyfob containing a MIFARE Classic 1K chip. This extremely durable, 100% waterproof thin keyfob is designed to be attached directly to a keyring. A useful alternative for contactless systems, it operates at 13.56 MHz wireless frequency, according to the ISO 14443A standard. The Mifare Classik 1K keyfob contains 1K bytes of read/write memory that can be used for multiple applications. MIFARE Classic keyfobs typically operate at a distance of up to 10cm depending on the power provided by the reader. This keyfob is NFC forum enabled. A picture of the MIFARE Classic 1K thin keyfob is shown below.